Hypertufa is a man-made substitute for Tufa rock, a spongy cellular rock found in limestone country. When water wears down the rock and leaches out some of the original materials, it leaves the Tufa with a porous spongy consistency. Although Hypertufa has the appearance of natural stone, it is relatively lightweight, so it's easy to move and transport. 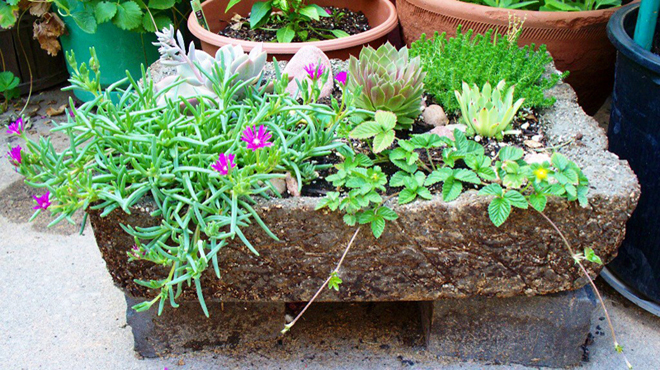 Hypertufa pots are suitable for many sorts of plants and are particularly good for cacti, succulents and alpine plants. The bulky and porous wall thickness acts as a reservoir for water from which the plants can drink between waterings, and it allows for easy passage of air to the root systems. Each pot is meticulously cured to enable it to overwinter in intense conditions. Every Taos Tufa container is hand-made. There's a wide variety of shapes, sizes, textures and colors. Contact us and we'll find the Tufa that is uniquely yours.